How do I take my hand prints? 1) Make a print of both your hands. Use printers ink which can be bought from a bookshop.Take a piece of glass or tile or a plastic top big enough to take the shape of your hands. Put a couple of beads of ink on to it spread and with a roller. Keep 2 A4 pages ready. Transfer the ink from the plastic to your hand with the roller making sure you roll ink in all areas of your hands. Put one A4 page on soft pad such as mouse pad. Place one hand onto the paper firmly and apply pressure under the pad with your other hand to make sure all areas of the hand has made contact with the paper. With a pen or pencil make an outline of your hand. Remove your hand gently from the paper. Write on the paper which hand it is (right or left), date taken, your name and your date of birth .Repeat with the other hand. Below is a diagram of how to help you to take the ink print. 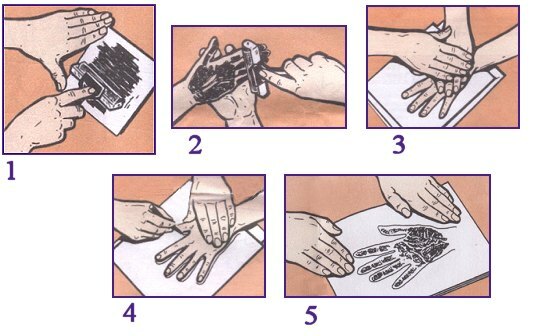 2) Make a photocopy of both your hands. Sit on a chair so that your hand is at the same level as the photcopying machine. Have a large cloth or a towel ready. Put your palm gently on the photcopying glass where you would normally put the paper to photocopy. Make sure you do not press your palm hard on to the glass. Replace the photocopy cover. Cover the top of photocopy cover with the towel so minimum light enters while photocopying. Start the photocopying. Take the photocopy and label it with which hand it is (right or left), date photocopy taken, your name and your date of birth.This is an electrical equipment and I do not take any liability to any injury caused. 3) Draw the lines on your hand. Draw an outline of your hand on an A4 page with a pen and try to draw all lines as closely as you can. This is not the most accurate method but a general reading may be obtained. Label it with your name, which hand it is (right or left), date taken and your date of birth. 4) Photograph your hands. Take a close colour photograph of both sides of each hand. Mark the back of each photo with which hand, your name, date of birth and date taken. 5) The easiest way to send me a print is to scan both of your palms. Take the same precautions indicated in number 2.